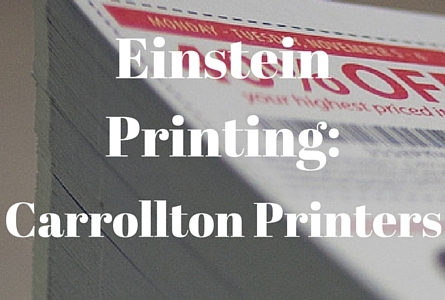 In the thirty six years since Keith Einstein first opened the doors at his Carrollton printing company, Einstein Printing, what started as a quick print service has become a steady, reliable partner to small, medium and large companies, schools, not-for-profits and government offices. Einstein Printing’s secret to success has been providing consistently high quality, affordable and convenient commercial printing to a growing list of repeat customers in Carrollton, Addison and other surrounding communities, and the entire Dallas Metroplex. Why work with a commercial printing company in Carrollton? A common myth is that it's cheaper to do your own printing in-house, and for an occasional photocopy where appearance does not matter that may be true. However, when it comes to business forms, letterhead, brochures and flyers, newsletters, catalogs, annual reports and other business print and copying needs, both routine and specialized, there are many advantages to being Einstein Printing customer. On the cost side, Einstein Printing buys all its supplies, from paper to toner, at bulk wholesale prices, and keeps all of its printing machinery well-maintained to maximize useful life. Einstein Printing's customers reap the benefits of these savings, making it easy to see how bringing your commercial printing needs to Einstein Printing can make financial sense. Making a smart financial decision isn't the only reason that customers turn to Einstein Printing over and over again. Einstein Printing's advanced equipment can print in unconventional sizes and shapes, and offers a wider selection of paper qualities, paper textures and color intensities than are possible using even the most advanced, expensive office printers. Customers also choose Einstein Printing to avoid all the hassles of do-it-yourself and free up valuable time to grow their own businesses and keep their own customers happy. Being an Einstein Printing customer means no more hours lost bent over an office copier printing, reprinting, resizing or troubleshooting, or driving to a store because you've run out of paper or toner. In fact, for Einstein Printing customers, there's no time lost driving anywhere - Einstein Printing cheerfully offers fast pickup and delivery service in Carrollton and surrounding communities. Additionally, expert phone consultation is available at any time, while prospective customers are always welcome at Einstein Printing's convenient location on Surveyor Boulevard. 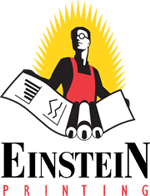 As the leading Carrollton commercial printer, no job is too big or too small for Einstein Printing. Einstein Printing's Carrollton Printing Services, which also include event invitations and programs, customized stationery and letterheads, booklets and manuals and marketing materials, has been a mainstay of Einstein Printing's services throughout their 36 years in business. It’s a big reason that customers keep coming back, but it's not the only reason. In addition to commercial printing and Carrollton Vehicle Decals, Einstein Printing also offers a wide array of related services, including mailing, finishing and binding, promotional products, signs and banners, trade show and event marketing, and identity and design services. Carrollton Mailing Services/Direct Mail, for example, includes targeted outbound mail as well as "every door" (EDDM), and letter as well as postcard; they offer simple print & mail or can assist you with from full consultative design work from their experienced creative team, which has successfully executed on Direct Mail programs for companies and organizations like your own. Carrollton Commercial Copying Services - We'll take care of your Copying needs! Carrollton Promotional Products - Your business info, but better! Get all your important details on a mug, pen, tee shirt or more! Carrollton Creative Services - Let our design specialists help develop your brand. If you're already an Einstein Printing customer, you may well be a repeat customer who has come to appreciate their reliability, affordable rates, high quality and wide choice of products and services. You may even be one of Einstein Printing's customers whose testimonials can be found on Einstein Printing's website, or on their Facebook page. If you're not yet an Einstein Printing customer, a quick look at Facebook will show you what businesses and organizations like yours are saying about the Einstein Printing advantage: "quality of the finished product is always top notch... a real concept of what customer service is all about... a joy to work with... they have always exceeded my expectations." Whether you're actively looking for a professional printing company, or just curious whether there's a better way to handle your printing needs, why not look into what Einstein Printing can do for you. Call them at 972-776-2244, request an estimate, or stop by their convenient location at 1800 Surveyor Boulevard for a no-obligation chat today!